I’d like to begin by saying that I am not a superhero or comic book fan. In fact, I’ve never read a comic book in my life other than an old Beano book when I was about seven years old. I even put off seeing Batman Begins and The Dark Knight for years because I was convinced that Batman was for “kids”. How wrong I was. It wasn’t until I started getting into Christopher Nolan films that I decided to give Batman Begins a try and needless to say I was blown away. 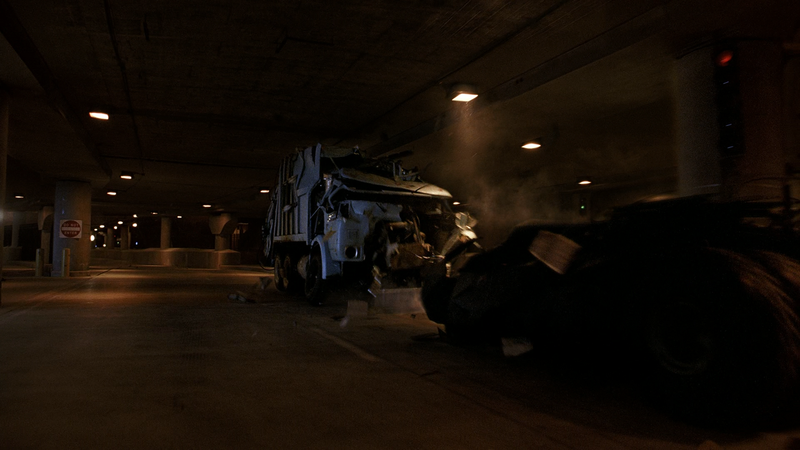 You can’t imagine how bowled over I was when I then watched The Dark Knight in blu-ray for the first time. Seeing The Dark Knight Rises on the big screen was just a whole new level bliss. 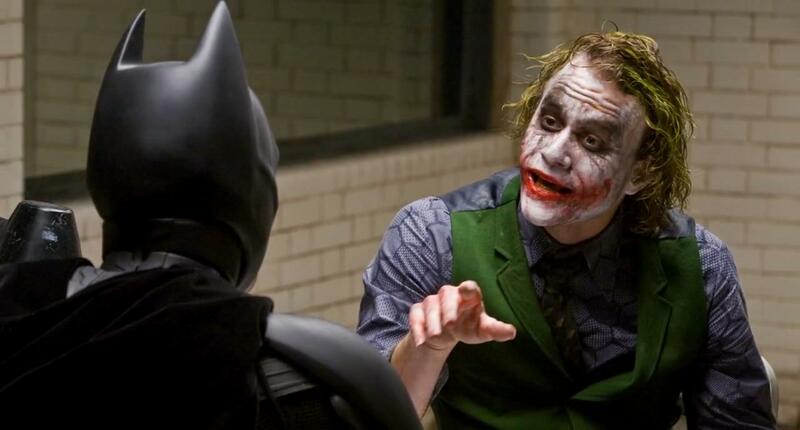 Christopher Nolan’s Dark Knight trilogy is my favourite trilogy of all time. 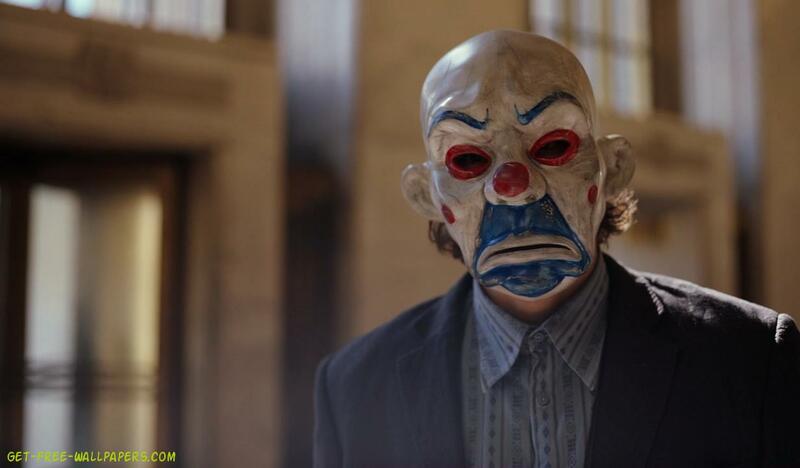 I believe that The Dark Knight and its sequel are two of the greatest films ever made. They’re pure art and are already iconic pieces of cinema that will surely stand the test of time. I once (famously, I might add) described The Dark Knight trilogy as being akin to a perfect three-course meal. 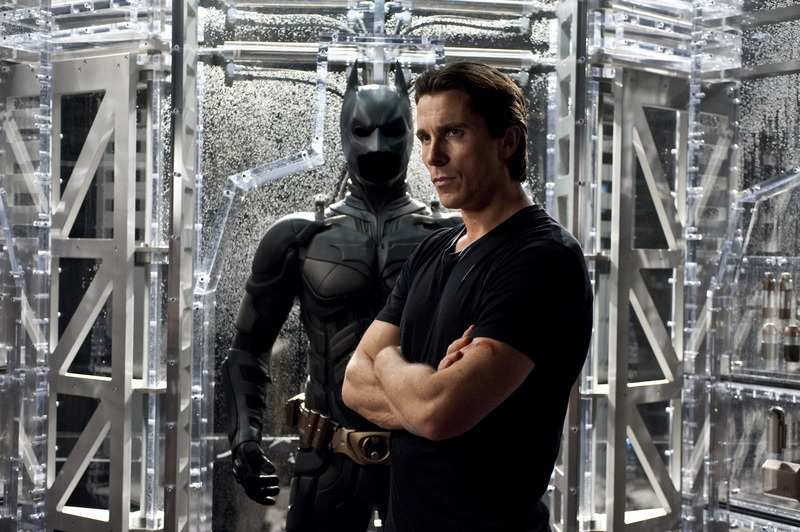 Batman Begins is the starter, a nice little warm-up which gets you excited for bigger things to come. The Dark Knight is the main course, arguably the best part of the meal. It’s the meatiest and tastiest part which leaves you completely satisfied. The Dark Knight Rises is the dessert. It’s just as good as the main course, but in a completely different way. Depending on your taste, it could even surpass it as it rounds everything off to perfection. 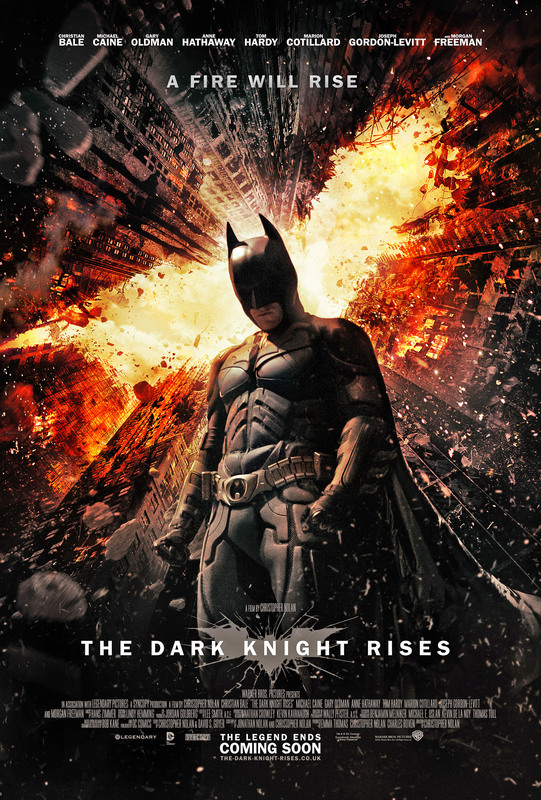 I am in fact one of those rare people who think that The Dark Knight Rises surpasses The Dark Knight, ever so slightly due to its atmosphere of dread and sheer scale and ambition. This trilogy is so much more than ‘superhero movies’. They’re individual pieces of art and contain some of the best filmmaking I’ve seen. There are so many incredible scenes, so unfortunately some real crackers won’t feature in my. I myself don’t even agree with this list so I’d love to hear your comments. 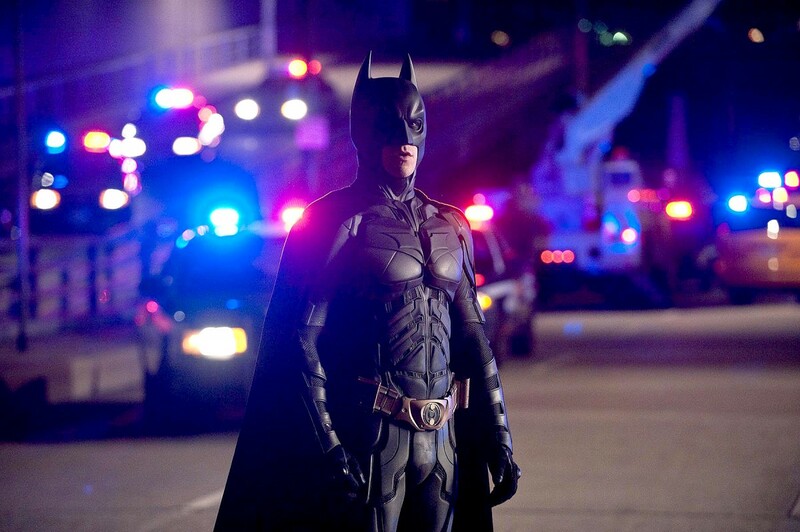 Without further ado, let’s delve into Christopher Nolan’s nightmarish world of Gotham city. The opening to The Dark Knight immediately tells you that this film is going to be a departure from the friendlier (but still dark) Batman Begins. In fact, this doesn’t feel like a family friendly superhero film at all! And that’s because it isn’t. This is a beautifully made crime/noirish sequence which feels more like a scene from Michael Mann’s, Heat than a 12A rated Batman film. Those who own the blu-ray will also confirm to you that it looks mesmerising. The opening shot never fails to literally take my breath away as we’re introduced to a frighteningly real world which looks like you could almost fall into it. All the gun fire feels unusually raw and real too, which is a good thing in my books. 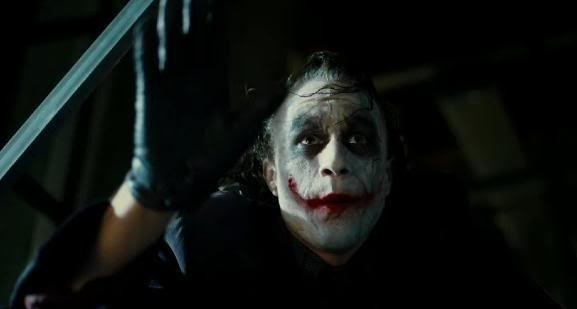 And of course, who could forget that introduction to Heath Ledger’s, Joker as he says those haunting words, “Whatever kills you makes you… Stranger.” This is a stonkingly good opener! I don’t know what it is about this scene, but there’s something about it which I find quite thrilling. There’s a spectacular set-up where we see that the building is full of the joker’s men, hostages and the joker himself, whose whereabouts have been unknown to Batman until now. It’s a set-up not dissimilar to a videogame and it’s heart-stopping to witness! What makes these action sequences feel so intense is that Christopher Nolan tries to use as little CGI as possible and shoot with few quick-cuts so we can actually see what is going on. The final showdown between Batman and the joker is also pretty spectacular. There’s something quite epic about a skinny man in a purple suit beating Batman to a pulp. I also love the way the camera spins as the joker is left hanging. It shows that the closer to death he is, the more unhinged be gets. Wonderful. I’d also like to include the boat scene in this which I really admire. Tense and powerful. I never fail to get chills during Jim Gordon’s flawless final words. After a very intense and frightening scene where Harvey-now-the-deranged-two-face-Dent almost blows a hole in the head of Gordon’s son. 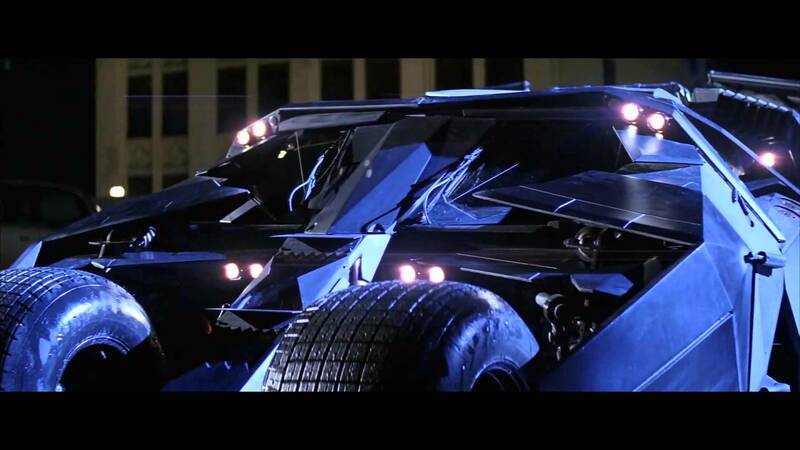 Batman heroically takes the bullet and plunges the damaged Dent to his death. He then runs off like a thief into the night alongside Hans Zimmer’s grand score and Gordon’s speech before rapidly cutting to black. It’s a fantastic moment and so well written by the Nolan brothers. Some may find the speech contrived, but I see it as something theatrical and grand in scale. I also love the lighting here. 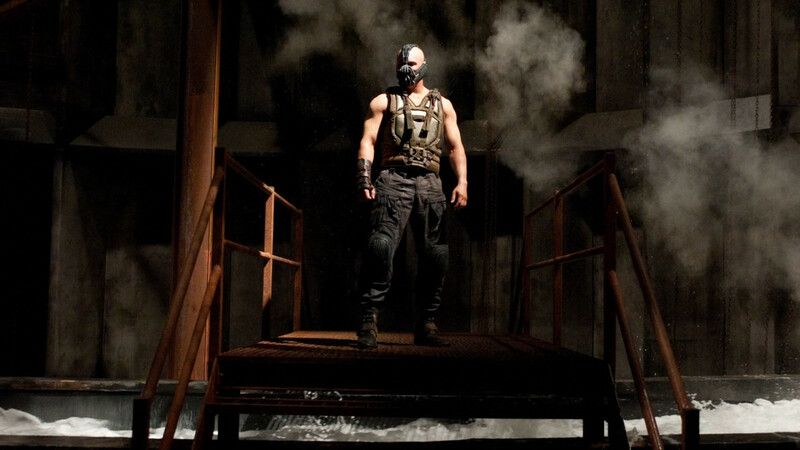 Some may disagree, but I think the introduction to Bane is even better than the Joker’s intro! What a stroke of genius to have a villain the complete opposite of the Joker, a cold, calculating and hulking figure who is actually a match for Batman! This whole scene is exhilaratingly filmed. The gorgeous scenery and insane special effects make it all the more intense to watch. There’s also some fantastic music here as well which elevates everything. You also can’t help but admire the stunt work here and the way Nolan directs is just flawless as he gets right in on the action with no shaky cam or manic quick cuts! This just goes to show how powerful Bane is and how he always has the upper hand. I also absolutely love his voice. You’d expect him to have the voice of a bull frog, but instead it’s like Shaun Connery on acid. Tom Hardy did almost the impossible, and made us forget about Heath Ledger’s electrifying performance. Whilst Bane still doesn’t reach those heights, he’s still a bloody excellent villain in his own rights. Christopher Nolan himself announced the other day that this was his favourite scene from his entire career! This is the moment when we realise that Bane really means business. What would normally be the big finale to a superhero film occurs barely halfway through. It’s the moment where the hero usually comes to stop the villain just before he carries out his evil plan, but not here. The Nolan brothers clearly don’t care for convention and their films are all the more better for it. Bane wins and we’re all surprised. After this moment there’s a fantastic atmosphere of dread where everything seems hopeless and huge in scale. The stadium explosion itself is incredibly well shot. After hearing Hans Zimmer’s masterful, menacing score there’s suddenly silence with just the voice of a innocent child singing and the looming image of Bane in a brilliant coat making his way to the stadium entrance. To top it all off Tom Hardy (apparently) improvises the haunting line, “It’s a lovely, lovely voice” before blowing the stadium to shreds. It’s magnificent to watch, as is seeing all the bridges blow up. Most directors would shoot this from every angle possible in a series of quick cuts, but Nolan only uses one or two shots to really capture the reality of what’s going on. And it really works. Bane makes many powerful speeches in the film, but this is probably my favourite. 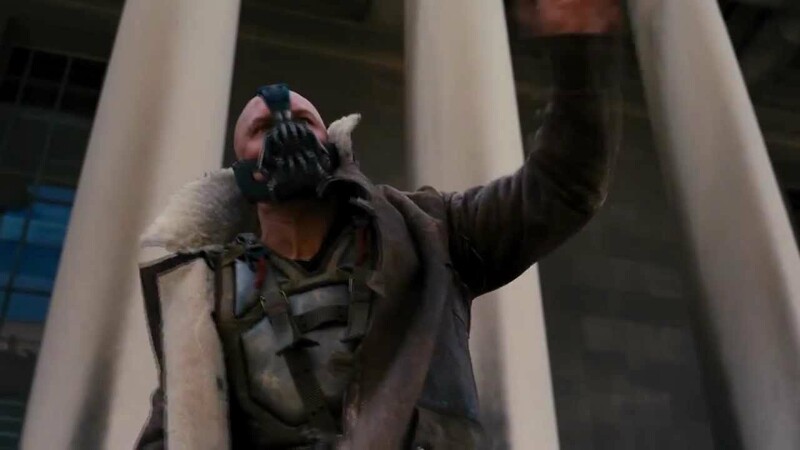 Bane has won and has proudly put himself up as a vicious dictator. He shatters the reputation of “hero” Harvey Dent by reading Gordon’s real speech and liberates the criminals of Gotham by blowing a hole in the prison wall. To top it all off he goes on to explain his plans for Gotham, including blowing it to smithereens. This really shows off the incredible writing skills of the Nolan brothers. They really know how to get inside a character and make them endlessly quotable. I also don’t think that they get enough credit for what they did with some of the Joker’s lines. Christopher Nolan really did end the trilogy with a bang. I’ll never forget seeing this bomb chase scene in the cinema. My heart was racing and chills covered my spine. It was so intense to watch, it’s a feeling I’ve not had since watching Black Swan for the first time. The whole scene is flawlessly done. The music, the directing, the special effects, the sheer emotion. Perhaps it’s because the film is so unpredictable that you don’t know what’s going to happen! Everything seems so hopeless. Alas, Batman gets blown to pieces and saves Gotham, almost like Jesus atoning for everyone’s sins. Or does he live? I also love the scene where Gordon realises that Batman is Bruce Wayne. It’s all so powerful and emotional. Especially when Alfred’s crying his eyes out at the funeral. Oh, and here’s some trivia that you might not know. The bomb actually ticks down in real time! This also subconsciously adds to the intensity. The iconic interrogation scene features some of the best acting and writing ever committed to film. You can feel Batman’s reeling anger as he brutally beats the Joker. It’s like he actually wants to kill him! But the more angry Batman gets, the more amused the Joker is. He just smiles more with every punch. This is really tremendous acting from Heath Ledger and it’s also the scene where the Nolan brothers give the Joker his most iconic lines such as, “Does it depress you commissioner… To realise just how alone you really are.” The directing here also really captures the emotional intensity of everything. To top it all off, there’s Zimmer’s menacing high-pitched score for the Joker playing over which ratchets up the tension a couple of notches. There’s also that breathtaking moment afterwards where Batman has to save either Harvey or Rachael. If it was any other superhero movie, then Batman would find some sort of way to save both unharmed. But this is Christopher Nolan, and he really hits home when he decides to blow up Rachael. This makes finding the Joker, much more of a revenge quest for Batman. Most will probably disagree with me here, but for me, this is probably where the trilogy hits its highest point. This scene really shows how much of a talent Christopher Nolan is as a director. He shoots everything for real and uses extremely little CGI, which makes the action feel real. It doesn’t feel like you’re watching a movie any more, it’s like you’re actually there and it’s heart-stopping to watch. The Joker rolls up in his comically graphitized truck with a bazooka, trying to blow up the prison van which Harvey’s in and it’s frightening to watch because it just feels so real! 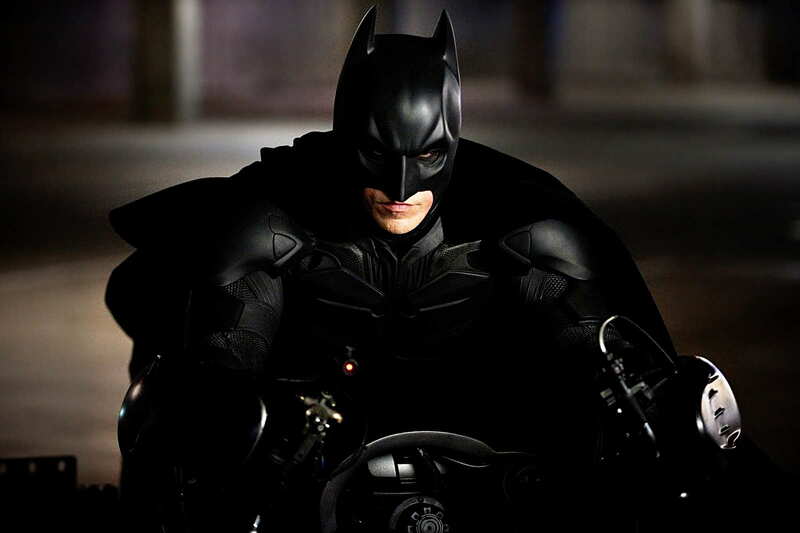 The stunts here are just incredible to watch as Batman’s new motorbike feels like it’s going to pop out of the screen. Everything’s going on here: a helicopter crashes, the tumbler dies, Batman crashes through a window, the Joker steals a huge lorry and Batman finally turns it over in spectacular style. But things only get more epic when the Joker crawls out of the wreckage and toys with Batman’s “one rule”. It’s hair-raising to see Batman rocket towards the hapless Joker as he shouts, “HIT ME! HIT ME!” The whole sequence is damn near perfection. I truly believe that it’s quite simply one of the greatest action sequences ever filmed. It just feels so powerful, intense and real. So there’s my list. I know, I know. Your favourite scene isn’t in there, right? Well to be quite honest with you if I did a 20 greatest scenes, I would still miss something out. I would’ve loved to have included the stock market scene, Batman and Bane’s first fight, Alfred’s leaving and the scene where the Joker makes an appearance at the party. There are just too many great scenes to admire in this awe-some trilogy. What are your favourites?